With the Upgrade to 6.3, the domain compuwareapmaas.com was replaced by dynatracesaas.com. If your SaaS instance is still using compuwareapmaas.com make sure to use the dynatracesaas.com domain as the compuwareapmaas.com domain will be de-supported by December 2016. 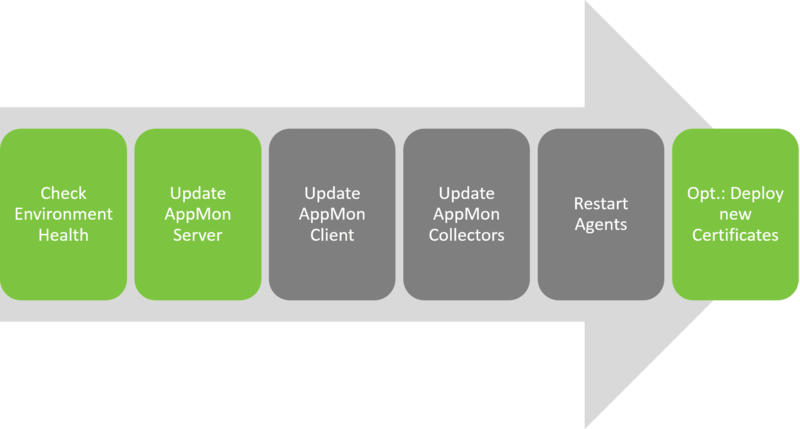 Dynatrace AppMon 6.5 (Dynatrace AppMon 6.5 Release Notes) has been released on the 26th of September 2016. New AppMon SaaS environments will be automatically provisioned with the latest version of 6.5 - older environments can be migrated on customer request by opening a support ticket and by indicating their desired maintenance window. Any clients that you have installed on your own infrastructure will need to be updated to 6.5 manually. These can be pre-installed in parallel with the 6.5 version. Alternatively you can use the webstart client available on your SaaS server at https://<customerID>.dynatracesaas.com:8021/. If there are problems with upgrading the client, a separate support ticket needs to be created. Attach any available client log file. Any collectors that you have installed on your own infrastructure will need to be updated to 6.5 manually. These can be pre-installed in parallel with the 6.5 version as long as they are not switched on before the update of the Server to 6.5. You are required to stop your current collectors in order to migrate your current collector settings to the new collectors. Ensure the old collectors are not started automatically with a OS reboot. If there are problems with upgrading the collector, a separate support ticket needs to be created. Attach any available collector log or command line output while starting the process. If there are problems with upgrading the agents, a separate support ticket needs to be created. Any agent log file needs to be attached to this new ticket. if this has not already been done on your instance during the 6.3 upgrade, the Dynatrace SaaS team will deploy the updated certificates for SSL communication (collector-server) and HTTPS (Dynatrace Web). The certificates will be automatically deployed to the customer Collectors using the Certificate Wizard (Deploy Certificate). A re-start of the Collectors will be triggered to update the certificates on the Collectors.